Twin Cities Wine Education is proud to present Wine Geek Week, April 28-May 3rd 2019. A week of tastings, seminars, dinners, and of course the Grand Tasting, this time focusing on the incredible wines and diversity of Sonoma County! What makes the Russian River Valley so special? Why is this amazing location the source for so many incredible Chardonnays and Pinot Noirs today? 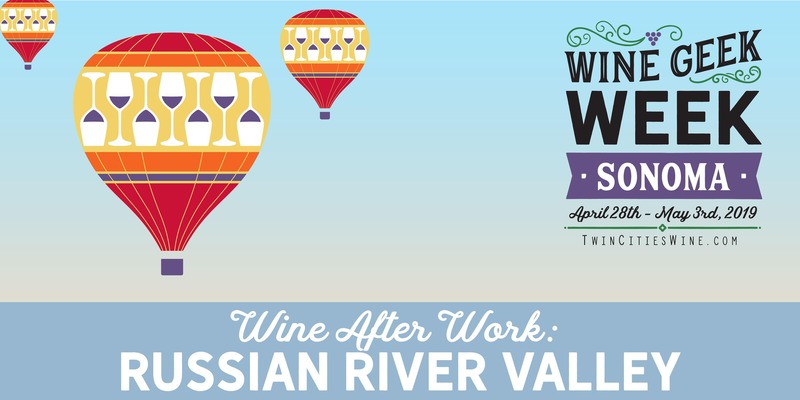 Join sommelier Shar Peterson for an in-depth talk about the Russian River Valley, starting with the history of the area and the reason it’s called the Russian River. Learn about the route of the river, the towns, the vineyards, and more. And of course, taste through a great range of wines to complement the discussion. Cool maps, great information, and four amazing wines plus some bites from the Black Dog kitchen await you for this special Wine After Work class. We hope you can join us for this very special Wine Geek Week presentation!